It wasn’t that long ago when iOS users were treated to a little app called Distiller. Its sole purpose of being is to recommend you whiskey for any occasion. If you’re an Android user and find yourself stumped when faced with a whiskey that doesn’t start with the word “Jack,” you may now rejoice, because Distiller is here. You can either have the app give you a recommendation or, if you already have the name of the whiskey in mind, you can search for it. If you decide to let the app make the decision for you, it will present you with a series of questions. After answering these questions, Distiller then presents you with whiskey recommendations based on how you answered the questions. While you can do so without making an account, signing in would theoretically improve your recommendations and allow you to rate bottles of whiskey. There are also customer reviews for those who wish for some human input, and you can also purchase or rate whiskies from the app itself. If you fancy yourself a whiskey historian, it also includes background information about the drink, which includes the whole whiskey/whisky debate. The recommendations Distiller makes are based a proprietary algorithm that takes a whiskey’s price, reputation, and “giftability” into account, as well as thousands of different data points relative to its flavor. The analysis produces what the developer calls the Distiller Flavor Profile, which is compared to other bottles in order to give you the best match. 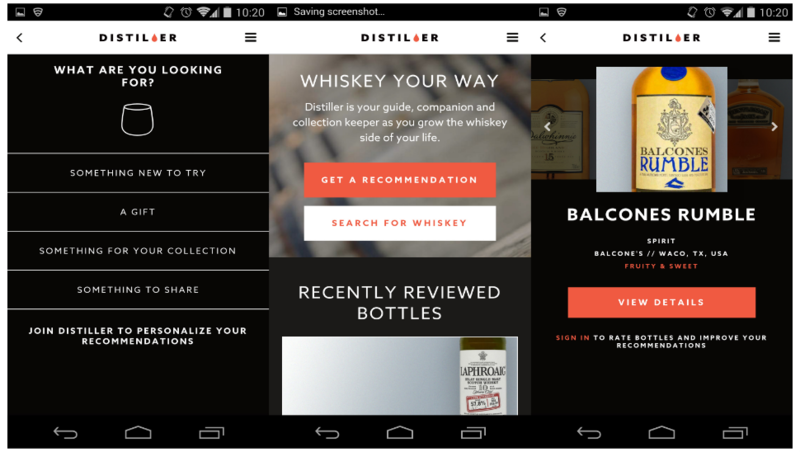 Grab a glass and download Distiller for free on the Google Play Store.